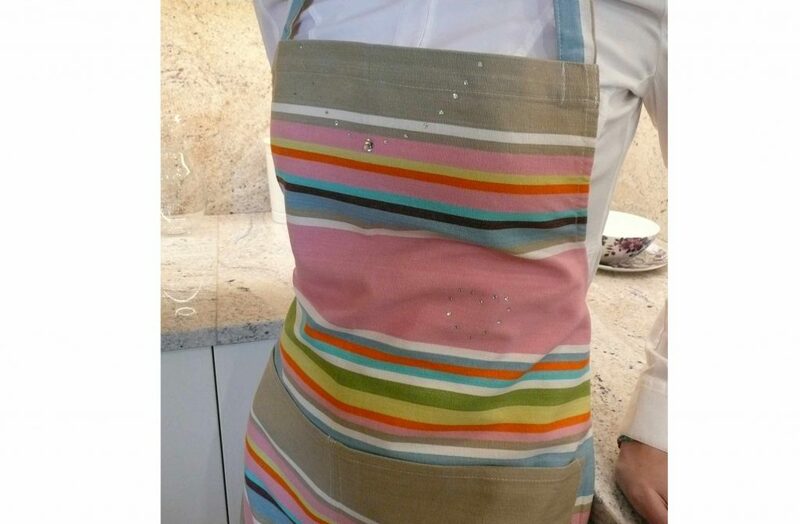 A sprinkling of Swarovski crystals has transformed our striped aprons, into one worthy of a domestic God or Goddess. Put Dickensian Christmas firmly in the past by hosting a candlelit meal wearing one of our Swarovski crystal aprons to delight your guests – or even reward your best friend or Mother in Law – these crystals have been applied by a specialist London couturier. This is a Limited Edition in ten of our best selling apron colours – so please hurry now whilst they are in stock. 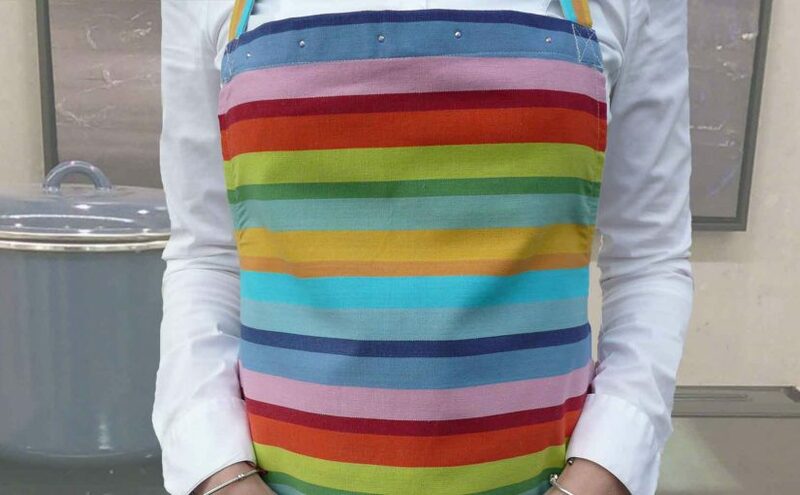 Our striped cotton aprons are also popular. Some customers collect them and give them as gifts to their friends and families. We currently have 53 apron colours in stock – probably the largest collection in the UK. Furthermore, they suit everyone! Provide coverage where needed with an adequate hand wiping area and wash beautifully time after time. In addition, capacious pockets are provided for all the necessary phones, hankies, pens and recipes. 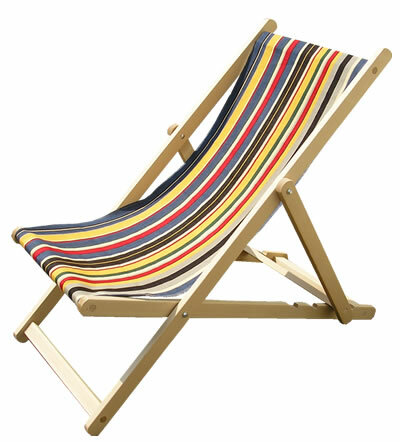 We have found a supplier of fabulous traditional folding wooden deckchairs made in the UK for our customers whose old deckchairs are beyond repair or those that haven’t got any to recover in the first place ! You can have your Deckchairs covered by us in any of our Deckchair Canvas or Vintage Deckchair Canvas range – that’s over 40 different deckchair fabrics to choose from! Mix or match – but we love them all different and clashing! The Stripes Company have been featured in a Funding Circle Case Study as part of a large marketing campaign. The Stripes Company bring you fun, playful, stripey Kite Hangers for bunting. Designed by us specially with kids in mind to decorate childrens nurseries to playrooms, bedrooms – and beyond! 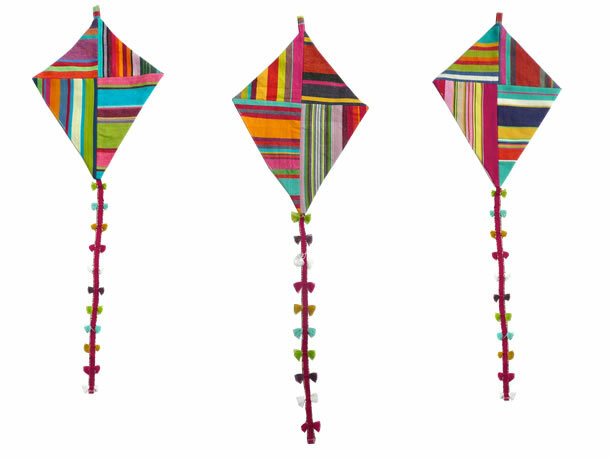 Three randomly colourful kites with Confetti Tassle fringe trailing streamers. Carefully stitched with four different striped fabric sections and lined with fine cotton on the back. Each kite comes with a loop on the top for hanging from lights, curtains, ceilings or walls. For more kids room decoration ideas why not string a few packs of three together with The Stripes Company Rope Braids in various colours to make Kite Bunting…? I love the colours and can’t wait to get sewing. The Stripes Collection…An exciting, fresh and stripey new collaboration between Deckchairstripes t/a The Stripes Company – the Striped Fabric specialist – and Decorshade – the quality blind and window dressing company. Decorshade, a Charles Bell Group Company, supplying quality blinds and related accessories in England. Local to the North West, based in Manchester, Decorshade offer you bespoke blinds and window dressings using Deckchairstripes t/a The Stripes Company striped interior fabrics. Beautifully fitted and made to measure. Choose your fabric, choice of a roman blind, roller blind or other window dressing, The Stripes Company fabric and any trim / bobbles should you wish. Feeling the strain on the purse strings this Christmas Season? Wanting to overhaul your Wardrobe with new Winter warming fashion items? The Stripes Company bring you a lovely and creative solution…DIY Wardrobe reinventions to revamp your old Winter favourites! Headband perfect for Skiing with your choice of Bobble to coordinate or clash with any outfit – simply interchange! The Stripes Company offer something for everyone and everything. At reasonable prices by the metre you do not have to spend a fortune to make a piece of clothing stand out from the crowd. These Mohair Wool hand knitted mittens are adorable and made really cute for Christmas with the addition of the Bobble Trim Cotton Pom Poms, simply sewn on! Why not do the same with drab looking cushions, chairs, stools or trim the edge of pillowcases? For more ideas and pictures of DIY Wardrobe revamps see our Pinterest Boards. Grey Woollen Scarf – plain and looking fairly worn out but with these pastel bobble fringes in pink, green, purple and lilac it has come alive! Thai Handmade Authentic Harem Trouser Pant – looking gorgeous with this warm Indian coloured webbing in red, hot pink, yellow, orange, purple stripes. The Stripes Company Interior Striped Fabric really is this versatile! Not just for home interior design…a happy dancing customer makes a Summer Wedding fashion statement by using Deckchairstripes striped cotton material for tailored clothing! The occasion? A Seaside themed Wedding in Brighton, Sussex right on the Sea front – a dream come true for Deckchairstripes t/a The Stripes Company! Men within the Grooms Party were dressed in waistcoats and naturally the Father of the Groom wanted to stand out! Deckchairstripes think he did a spectacular job, totally within the seaside theme in ‘Fastnet’ a Turquoise, Pink, Yellow and green stripe cotton fabric. discounted prices on our products. 100% Natural Yarn Dyed Cotton. 150cm width, in as many metres as you require. Selection of over 70 beautiful striped fabrics to choose from. Suitable for Blinds, Curtains, Upholstery, Recovering Seats, Cushions, Bed Linen, Craft Projects, Fashion Design, Clothing… & much much more! Order 5 x FREE swatches / samples of any striped material prior to purchasing. Call our fabric and product specialists on (00) +44 1244 336387 to discuss any of your queries. It’s warming up nicely in Australia and The Stripes Company Australia has some perfect items for the barbie season…whether you are heading to the beach or roasting your turkey on the barbie in the garden patio! 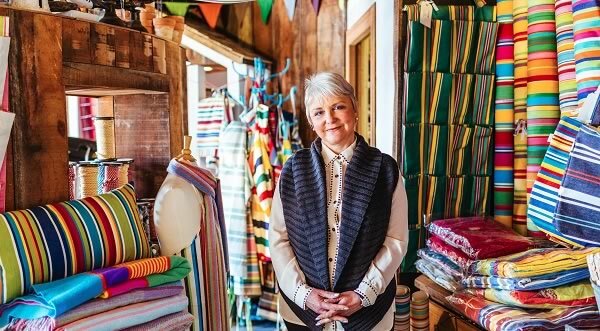 Deckchairstripes, having rebranded as The Stripes Company, is the stripe specialist bringing exclusive bold beautiful Striped fabrics and products to Australia! With over 30 Deckchair canvas fabrics for recovering your traditional wooden folding Deckchairs and stylish Directors Chairs, we hope to brighten up your town, country or beach house with colourful stripes for the Beach, Country & Home. Wanting to stand out in the BBQ crowd? Beautiful barbie season dressed Dining Table – Deckchair canvas as a table runner in Vintage Deckchair Canvas Waltzing Stripe and striped fun Sun Hats! Wanting to stand out at the Beach this barbie season? Take a look at the vibrant luxury cotton beach towels with matching extra large beach bags available to purchase..
Just visit www.thestripescompany.com.au to view some beautiful items delivered straight to your door in Australia!